In 2006-2007, a bamboo species will flower over vast swathes of Mizoram, Tripura and Assam. When bamboo flowers, it dies; usually a famine follows. How prepared, asks nitin sethi, is northeast India this time? Can they turn disaster into opportunity? The abundance of seeds in moist areas then invites rats and rodents, whose fertility, as nature would have it, increases when they feed on bamboo seeds. A study by Fabian M Jaksic and Mauricio Lima, ecologists at the Center for Advanced Studies in Ecology and Biodiversity in Chile, records a clear relation between rodent outbreaks in South America since in the 16th century and bamboo flowering and high rainfall. No such study exists in India, though a record of different species flowering in Mizoram does(see: Every 48 years). People say when mautak flowers, rat numbers turn abnormal. They run amok, quite literally. Calamity occurs after all the seeds are eaten: the rats attack granaries, fields of standing crops, paddy, fruits, vegetables, whatever is available. It happened so in Mizoram in 1959. The Mizo people lost everything (see: "Once the rats came..."). No help came from the plains of Assam, many allege. Famished, boiling with anger at alleged discrimination, they rose in armed revolt against the state. The Mizo National Famine Front formed at the height of the famine; today it is called the Mizo National Front and the state chief minister today, Zoramthanga, is its leader as he was one of the leaders then. He knows the threat is clear and present. In 2002-2003, 34 villages faced an increase in rodent population. In 2003-2004 another 16 witnessed it. 85 villages have already recorded sporadic mautak flowering, as per a directorate of agriculture report. But when flowering peaks in 2006-2007, a mautam -- a famine driven by mautak flowering -- is predicted. Out of the 2,108,700 ha geographical area of Mizoram, 87.42 per cent (1,843,000 ha) is forested area as per the State of Forest Report 2003 . Of this forested area, the state government reports that 51.38 per cent (1,254,400 ha) is under bamboo and that 68.06 per cent of this bamboo forest area (644,600 ha) is completely dominated by mautak, though another 9 per cent has small patches of mautak. An estimation by Jorhat-based Rain Forest Research Institute in 2002 suggests almost the same. It says mautak actually grows over an area of 850,000 ha. The Union ministry of environment and forests MOEF has estimated, in 2005, that 510,000 ha of the mautak-dominant area will flower gregariously. For the Mizo people, mautak is an integral ingredient to jhum cultivation, practiced over more than 70 per cent of the land at one or the other time. As Michael Lalmanzuala, a retired chief secretary of Mizoram, explains, "In January and February the rural folk begin to fell bamboo for jhum. In March they set fire to the fallen bamboo, turn it to ash. This ash is the best nutrient our steep and young, muddy hills can get for cultivation. Without mautak, cultivators can grow nothing." The state's forest department also earns revenue. According to the state's Bamboo Development Agency (bda), at present only a small percentage of resource -- 28,315 tonnes per year -- is harvested for local construction, and small handloom and handicraft production. The maximum possible yield of bamboo in the state, though, works out to 3,237,689 tonnes per year if harvested completely. Presuming a royalty of Rs 1 per pole (what the state charges today for extraction; 250 poles make a tonne) the government could earn a phenomenal Rs 8,09,42,250 per year. In other words, what is currently extracted is just one per cent of the total resource available. Mizoram makes about Rs 66 lakh as annual royalty from bamboo sales, according to a report of International Network for Bamboo and Rattan (inbar), an international ngo the Mizoram government asked to make the first report on the state's bamboo resources. It is a pittance, but with other forestry operations grinding to a halt since 1996, it is a substantial 40 per cent of revenue the state makes out of the forestry sector -- Rs 1.63 crore in 2001-2002 according to the Forestry and Wildlife Statistics 2004. In 2000, the state government set up a state-level rodent control committee. In 2002, it asked inbar to develop a bamboo development action plan. It has created the bda as the nodal agency. Working in tandem with the Centre, in 2004, it also prepared the 'Bamboo Flowering and Famine Combat Schemes' or baffacos: 16 state departments came up with plans to tackle the challenge of mautak flowering (see table: Dream plan); Rs 556 crore for 5 years, beginning 2004-2005, was budgeted. This plan is indeed all-encompassing. It envisages a four-pronged approach. One, the state government wants to evacuate (fell) as much bamboo as possible before it flowers and dies. Two, to prevent famine it will store larger volumes of foodgrain than done under normal circumstances. Three, it will try and diversify crops and agricultural livelihoods to reduce dependence on subsistence agriculture. Four, it wants to develop bamboo as an industry. Also, to help the northeast states, the Planning Commission has begun a Centrally Sponsored Scheme, to be operated by the Union ministry of environment and forests MOEF, also providing additional central assistance to fight flowering. For a state that woke up to the menace in 2000, not much has happened on the ground, except official parleys and fund-seeking from the Centre. "Ever since the locus of bda shifted to the industry department there has been complete inertia. They have no clue about forests or its resources, have never believed that bamboo can be a raw material for industrial products," says a senior officer in the state forest department. The forest department, claims an official in the planning department, is smarting from the loss of complete control over the agency. A tussle is on; meanwhile funds have been released to demarcate coupes and enumerate the growing stock in forest divisions. Peak flowering is only a year ahead, but this work is nowhere close to completion. "What can we do even if we have done all possible demarcations? We should have built roads into our most vulnerable areas long ago. Now each department is into building its own roads (to take out bamboo)," says David Thangliana, of Centre for Environment Protection, an Aizawl-based ngo. The MOEF reports that of the 510,000 ha expected to be hit, only 120,000 ha are at present accessible for extraction. Clearly, the state is far from realising its potential of extraction. But then, the state has always abdicated its responsibility in this respect. Only look at the way the trade in bamboo currently occurs. Do most of the forests in northeast India belong to its people, as is commonly thought? Mizoram proves it's a white lie. 562,226 ha of forests in the state are declared reserved forests. This includes the forest 800 metres each side of the major rivers. Some of the richest bamboo groves exist in these forests, segregated into zones or mahal s. And mahaldars or contractors -- usually non-Mizo people -- get to bid for this bamboo and cut it at will. The bamboo is then sold to two paper mills of the Hindustan Paper Corporation Limited (hpcl), based in Assam and the biggest purchaser of Mizoram bamboo. The bamboo is floated down rivers to roadsides and then taken via road or rail by contractors. They pay a royalty of Rs 1 per pole and can take out as many as they want. "Right now we don't even know how much bamboo is being cut. To say that mahaldars under-report is to put it mildly. We are now going to build the first booms across major rivers used to transport bamboo," says L R Thanga, conservator of forests, Mizoram. The forest department admits a large volume is also smuggled out to Bangladesh. "The mahaldar s engage us in Assam. We come here , work for three weeks at a time, cut as much as possible, push it into the rivers or bring it up to the roadside, take our daily wages and go back," says Siraju Mohammed, a labourer who has worked in the Kolasib forest division for last several years. Most of the bamboo gets cut in areas close to the paper mills. Thus the most heavily-cut forests lie along the Aizawl-Silchar road. "The economics does not work out for the contractors to access areas in South Mizoram," says Thanga. The paper mills and the contractors completely monopolise the trade. Thus, villagers close to mahals have no alternative but to sell to the contractor at whatever price is offered. Mizoram is parleying with the hpcl paper mills -- the biggest in the region -- to see if they will pick up more bamboo than they do at present. "The ones outside northeast India have made it clear that the economics does not work out for them. They will buy only if they have no alternative. Also, bamboo from Mizoram has an extra entry tax since it passes through Assam," says Thanga. The state government has reached an agreement with hpcl, North Cachar to supply 800 metric tonnes of bamboo chips directly, not through mahaldars. 400 metric tonnes have already been supplied, and the bda is preparing to procure the rest from the Rulpuihlim-Rawpuichhip area, via bamboo chipping plants the government set up recently. The government has also exempted royalty payments for bamboo sold to bda, to curb the mahaldar business. A mechanised semi-portable ropeway has been installed at Vankal Ram under Champhai forest division to facilitate extraction. But none of these measures can break the stranglehold of the hpcl paper mills. And as mautak flowering nears, there will be a glut. Contractors are sure to make a killing. The only way out is to create alternative bamboo-based industries, micro- to large-scale. But the state's first attempt to go large-scale, to make bamboo-based boards, is yet to take off. A factory was to be set up at Sairang, as a joint venture between the state government, Mizoram Venus Bamboo Products Ltd, a Kolkata-based firm and Boarke Machine Company Ltd., a Taiwanese firm. Rs 4 crore was the project cost, and the Centre released th entire amount to the state. Yet in July 2005, Lakshmi Chand, secretary, Department of Development of North East region, noted: "Though some machines were found to have arrived from Taiwan and some were already installed, most were lying idle...nobody could inform the exact date of commissioning." By January 2005, when Down To Earth visited Mizoram, the government had not even begun thinking of any micro- or cooperative-based enterprise. There is only one large handicrafts entrepreneur in Mizoram: Ramhmangaiah. He makes over Rs 25 lakh per annum in domestic sales and exports. He says, "I went out for just one international fair and got an order worth one crore. I could not muster enough resources to do even half the work in a year. So I let go of it. The entire state put together cannot accomplish the order at present." He now buys Chinese bamboo products and tries to innovate or imitate them. "You won't believe what all is possible. If I can make so much money by merely producing clothes-hangers and umbrella handles, imagine the market." According to a 2005 MOEF status report: "The (state's) Industry Department is planning to utilise bamboo resources for panel making and charcoal making." The industry department, meanwhile, believes that 'whether or not bamboo-based, development and upgradation of infrastructure is necessary'. It wants to spend Rs 80 lakh and build/refurbish industrial estates. If Mizoram corrects the direction of its industrialisation to push hard for a multi-layered bamboo-industry, it is bound to come up with another roadblock: dead bamboo. baffcos documents accept the state cannot evacuate all bamboo to the paper mills in time. Natural regeneration of even the hardy mautak, from the left over rhizome in the ground, will be sporadic and three to four years will pass before stocks build up, even in the most favourable ecological areas. The people will require mautak for jhum cultivation. Adds David Thangliana of the Centre for Environment Protection, "The firm root system of mautak holds the young soil of our hills together; thus, landslides could increase if we don't grow mautak quickly." But the government is looking to grow other bamboo species. Paper mills do not like mautak. It has thin stems and low pulp value. "The paper mill has approached us to plant species they can buy and also gain out of. The forest department is keen to grow thick-walled species, to ensure people can sell it to the mill," says one senior forest officer. Records show that seeds of Bambusa bambos, D hamiltonni and other thicker-walled species have been procured, and seedlings are being raised in forest department nurseries. That's what records show. As a conservator-level officer of the department accepts: "The only nursery really working is the central nursery at Turial." Mizoram is toying with the idea of bringing in exotic species from China and other places. But no research has been conducted on the impact new species will have on the soil and fertility of the land. Also, baffcos documents reveal the forest department is looking at bamboo plantations over a mere 27,000 ha. This time, famine control might cost the state more than the famine itself, for 49.5 per cent of all Mizos live in urban areas and can easily be covered by the public distribution system (pds). Only 4.5 lakh people live in rural areas today. Says Michael Lalmanzuala, a retired bureaucrat, "The government has not really worked out if we need to invest so much on distribution of subsidised rice. If our pds is really functional, rice will reach the poorest too. Then why do we need more rice? We need to make people self-reliant, not make them depend on the state again. During the 1959 crisis people suffered because they were dependent on the state." Says I V Ramanuj Rao, director (programmes) of inbar, "Instead of large godowns, they should have made small bamboo board-based storing vaults, incentive for setting up a bamboo board factory. Moreover, this would have ensured decentralised storing of grains by people." In jhum lands, he believes, the government should help people save grain rather than purchase tonnes of rice through pds. Mizoram's malaise also ails much of northeast India. Other states faces the threat, too, and the challenge of building a flourishing and equitable bamboo economy. The Rain Forest Research Institute estimates an area of 1,800,000 ha of mautak bamboo forests to suffer flowering. What will happen then? The region called 'the interior' -- the tribal-dominated hills of Tripura -- begins half an hour out of Agartala, along National Highway 44. Depending on whom you ask, it is either the domain of militants or the armed forces. Certainly the latter's presence is omphalic: soldiers, backed by jeeps mounted with light machine guns, deployed every hundred metres or so. They patrol and control all vehicular movement: time-bound convoys sinuously skirt the hillsides, and nothing can enter or leave this region without due permission. Through highway 44 flows all that keeps the state ticking -- cement, salt, iron; literally, 'development' trucked in from elsewhere. Week after week. Only Thursday stands out. On this day, every week, there emerge from 'the interior' hundreds of truck carrying the same cargo, a commodity the state refuses to acknowledge is its true hope: bamboo. Chakmaghat, in Dhalai district, is where 'the interior' and the rest of the world meet. It's a patch where the 166 kilometre-long Khowai river, running parallel to highway 44, flattens out as it enters plain-land. Bamboo is floated down the Khowai. It is picked out at Chakmaghat, loaded on to trucks and carted off. From Chakmaghat alone, in 2000-2001, 6.43 million poles of bamboo worth about Rs 82 crore were taken out of the Tripura hills. There are years in which the sale here has crossed the Rs 100 crore barrier. And Chakmaghat is only one of four such large centres of bamboo trade in Tripura. Tribals living in the 1,025 square kilometre (sq km) hilly watershed of the Khowai. Every Friday, they walk into the forest. It is an illegal entry, for the forests here are reserved (unlike in much of northeast India, Tripura's people have lost their rights over forests to the State). Once inside, they fell bamboo. Much of the forest in 'the interior' is bamboo-dominant. That's not surprising. Forests comprise 54.76 per cent of Tripura's 10, 491 sq km land mass. Of this forest area -- 5,447.84 sq km -- bamboo occupies over 2,397 sq km. 26 species grow in the state. Two species dominate: Melocanna baccifera (muli) and Bambusa tulda (mritinga). Muli is the most used. Around 80 per cent of bamboo utilised in the state comprises 3 species: muli, bari (Bambusa polymorpha) and barak (Bambusa balcooa). For four days, till about Monday, the tribals fell Muli bamboo. Then begins its floating. Bamboo measuring 10-12 haath (equivalent of a foot) is bundled into a pack of 12 or 16, called a kandhi. These kandhi can negotiate the small tributaries of the Khowai into which they are thrown. At the mouth of these tributaries are stationed people who grab the kandhi and lash them together to make a chali. A chali is a huge raft, 4,000 pieces strong. Once it is ready, two people -- usually non-tribals -- steer it down the river. The chali is kept close to the bank, to avoid getting sucked into the river. The two men -- one in front, the other at the back, clinging precariously to the precious cargo -- steer the chali for two days before Chakmaghat bobbles into view. By Wednesday or Thursday. The chali is docked by the roadside and dismantled. Narrates Selim Reza of Tripura Bamboo and Cane Development Centre (tribac), Agartala , "On a good day about 40 chali are docked. The bamboo piles up. Trucks arrive: the time has come for the most precious resource of Tripura's people to be legally smuggled out, for a pittance. The tribal in the hills has received Rs 0.50 for each bamboo pole he's felled. The same fetches Rs 1.20 to Rs 2.00 in Chakmaghat and Rs 3-Rs 5 in Agartala. Each truck takes out 3,500 to 3,700 muli bamboo." No walkie-talkies manage a traffic worth hundreds of crore. No one fails to deliver, no one falters on payment. It's as honest as exploitation can get. The most inconspicuous entity in this operation is a man used to driving -- with an accomplice -- almost 30-40 km past Chakmaghat to Ganganagar, deep into 'the interior'. He is a trader. He holds the licence to cut bamboo in the state. There he sets a deal with a tribal supplier, to get the bamboo to Chakmaghat. He leaves behind his accomplice, a chali navigator. Work done, he drives back to Agartala. It is extraordinary how impervious he is to the scrutiny of the security forces, the extractive demands of militants. Transit permits from the forest department aren't a problem. Nor is the passage of his trucks. In all this, what goes unrecorded -- what cannot be recorded -- is the money security forces, forest department officials and militants make out of the trade. In this 'disturbed' area, the bamboo flows downstream unimpeded. Effortlessly, it reaches Agartala. For bamboo, there exists no 'line of control'. Would it be an exaggeration to say that all nineteen tribes the state has are involved in this trade? It is estimated 2.46 lakh families in the state are engaged in bamboo-related vocations. Besides Chakmaghat on the Khowai, the trade thrives as Kalshi on the river Muhuri, Kumarghat on the river Manu and Sonamura on the River Gumti. Much of it goes into making the houses and walls of people in the region. Some reach paper and pulp factories in Assam. A lot is smuggled into Bangladesh. Who else makes money out of it? For the state government, it has become a major source of revenue, after earnings from felling timber dried up post-1996, the year the Supreme Court passed an order restricting timber felling in northeast India. 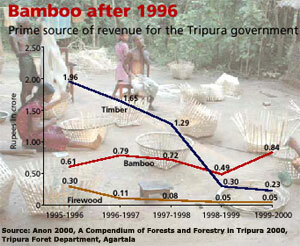 In 2000 bamboo comprised 76 per cent of the revenue the state forest department earned (see graph:). But for the tribal -- the resource's owner -- it remains a 50-paisa pole commodity. Tripura is a bit luckier than Mizoram. As compared to Mizoram which has 10.51 million tonnes of muli bamboo stock, Tripura has only 0.81 million tonnes to manage when it flowers. Moreover, it has a fledgling bamboo cottage industry to utilise the resource. Bamboo products -- though of low value addition -- do employ 70,000 people, according to the Tripura Development Mission, prepared by inbar. The industry after value-addition is estimated at Rs 71.2 crore. As per inbar estimates, Rs 635 are realised per tonne of bamboo used. This can be increased several fold. Right now such cottage industries use villages as mere raw material suppliers. Tripura's forests supply all the raw material of the country's agarbatti trade, except incense. But a mere 55 per cent of the trade goes back to the state, just because all value addition happens elsewhere. Says Pratap Dutta of Kumarghat: "A person in Tripura gets Rs 7 per kg of agarbatti, whereas the final product is sold for Rs 12.65. If people here layered the burning material on the agarbatti sticks, the weight would go up three times. And, the government charges octroi by weight. So won't it again if people were involved in layering the agarbatti? Today people in Goa smuggle out our material, process it and sell it as finished products. Why can't we do it ourselves?" he asks. Dutta should know. He runs one of the only four agarbatti factories in Tripura. Today there are signs that muli -- the bamboo variety used to make agarbatti sticks -- is fast disappearing. "But," laments Gopal Das of Tulakona, Jirania block, West Tripura district, "When we informed the government about bamboo flowering, we were asked to stop worrying and plant bananas. But how can we be so carefree? I can see seeds falling around and the culms drying up." "Earlier we would find bamboo in hours. But today, I can't find it even after walking an entire day. I don't know if its flowering or just getting cut but it's availability is much less today, compared to last year," confirms Konkila Debburma from Lalcherra village who earns a Rs 30 per day by slicing muli into 6-8 inch sticks for agarbattis sold at the weekly market three km from his village. But the state's tribal affairs minister, Jitendra Chowdhury, was quite nonchalant. "There is no lack of bamboo and we need not worry," he said. The state did start a few bamboo nurseries, some years back. But that self-help group-based programme was wound up due to disagreements with the partner, inbar. The entire plan to utilise bamboo is now being redrafted. The industries department has replaced the forest department as the agency in charge -- just as in Mizoram -- and the turf war between the two has already begun. Yet as per the status report it submitted to the moef, the state government has committed that extraction of muli "would be done by engaging local tribals and rural poor and will be supplied to hpcl or exported to Bangladesh". The state government also promised that "the possibility of setting up of a bioenergy unit with muli bamboo as feed stock will also be explored". The promises remain on paper. The local media tom-toms that a new common facility centre (cfc) in Kwaifaung village in South Tripura district has begun producing bamboo slivers. But a visit by Down To Earth revealed only a derelict shed. The unit had no power; even the forest department was oblivious of the machines it was supposed to run. The cfc was to draw local artisans towards mechanised methods of bamboo processing. But convincing artisans to leave their old methods -- and homesteads for an alien environment -- requires much more than new machines and a ten-day training programme. The development commissioner (handicrafts) of the Union ministry of textiles, however, believes the cfc is just what the northeast's bamboo economy needs. 12 such centres have been set up in the Northeast. Of course, baring a couple, the rest lie idle. In Shillong, Meghalaya, standing in the decrepit backyard of what was earlier a watch factory, Mendon Pariat, director of the Meghalaya Handloom and Handicraft Development Corporation, shows the idle cfc machinery. "Only two machines worked. The rest could simply not work the bamboo here. People here make sliver only out of the outer layers of bamboo, but these machines would only work on the harder insides. People did come for training sessions, but they never came back to work at the centre." The situation, says an expert who has been working with the Union government on the new National Bamboo Mission, says is true for other places such as Barpeta in Assam and Ziro in Arunachal Pradesh as well. Ad hocism runs rife. But even if northeast India does get a mother industry that adds value to the first-level processed bamboo, creating smooth supply channels will not be easy. Inderpal Singh of Timpack industries, in Byrhnihat, Meghalaya, which has just started making corrugated sheets of bamboo mats, sums up the problem, "When we decided to set this factory up, we were told that people here produce more than 20,000 mats daily. But I cannot get even 5,000. So, today only particle boards are produced in the factory. This unfortunately means that we only want raw bamboo from local people -- not mats, for which they would have got a higher value". Each state about to be affected by bamboo flowering in the northeast seems to be floundering into its own dark alley. Presently, muli flowering portends serious economic and social unrest in Mizoram, an equally debilitating threat in Tripura and a lost opportunity in most others. Part of the blame for this confusion goes to the Rs 2,600 crore National Bamboo Mission for Technology and Trade Development, planned in 2002 just won't take off. The states do earn some royalty from extraction but considering the area the plant covers, the sum is a pittance. State revenue could shoot if bamboo products were made in the region. But as of now, bamboo harvested in most states is either taken by the two paper mills in the region as raw stock, consumed within households at low value addition products like mats, or taken out of the northeast raw. Take Mizoram's case: it earns a paltry Rs 66 lakh as annual revenue. Much of the stock is unutilised for lack of opportunities to people. Assam, too, scuttles away its opportunities by leasing out all its reserve forests containing bamboo to the paper mills. (It intends to continue to do so even after the flowering, according to an moef report). One of Assam's thickest bamboo forest areas is in North Cachar hills -- reserved and the unclassified state forests together make up 4,890 sq km area of the autonomous district. In 2004, the entire area was given to a single person -- Ranbir Singh Gandhi of Hill Trade Agencies -- through his various companies. In 2004-2005, bamboo to the tune of 21,861 tonnes were extracted from this area, at Rs 85 per tonne - the cheapest rate in the region: that's the kind of business Gandhi now monopolises. Hill State Agencies plans to put up four chipping factories. Located at crucial transport junctures, the factories will turn bamboo poles into small chips that take less space. This will enable more bamboo to be packed into a truck and transported. He has paid his bit to the underground, everyone acknowledges, including him and the underground. In other areas, the hpcl paper mills have direct lease over the forests: they take out 5,268 million tonnes per year of air dried (mtad) bamboo in Barak valley, 8,000 mtad in Kamrup east division and 1,500 mtad in Nagaon. Till 2002-2003, hpcl was paying just Rs 62.50 per tonne. Now, it pays a strongly negotiated figure of Rs 118 per tonne. Regions of the northeast without a paper mill feel ignored. Nagaland is pleading with the Centre to revive the state's only paper mill, now shut. Some are too far from the paper mills to fit into their costing chart. Those regions wait for the National Bamboo Mission (nbm) to turn this wild weed into an economic miracle. nbm is meant to use bamboo development "as an instrument of poverty alleviation and employment generation, particularly in the rural sector". It will diversify, modernise and expand bamboo based industries through the application of modern technology and financial support; and "use bamboo as a means to achieve ecological security through plantation of quality species needed by industry and the handicrafts sector". The Planning Commission (pc) began work on nbm in 2002, but it remains a non-starter. A year-and-a-half ago the Cane and Bamboo Technology Centre, Guwahati helped prepare the detailed project report. In October 2005, the Union government's Expenditure and Finance Committee passed a note on nbm's formation. One to six months from now, the Cabinet note shall be discussed by the government. In the year bamboo flowering begins to peak in Mizoram and Tripura, the prime minister may release the plan for nbm . By the time the flowering gets over, we shall know what nbm was worth. Till then, the northeast states are busy looking for other avenues for money. The Union government's department of science and technology has begun a National Bamboo Mission on Applications (nbma) with a budget of Rs 100 crore. nbm is the mother mission; nbma was to be a part of it, the child that produced the technology and applications. But strange are the ways of the government: the cart may come before the horse. None of the officials want to speak on the mission because it is yet to go before the Cabinet. "Write on it a month later please, then it will all be in place," says M L Chowdhary, commissioner, horticulture, whose office under the Union ministry of agriculture (moa) has been made the nodal office. Details of nbm are not available in the public domain. It's worth Rs 2,600 crore, as per the 2003 report prepared by pc. It's much needed but not in the shape it is taking. Realising that four-fifths of the 10 th Five Year Plan is already over, the budget for nbm for 2005-2006 has been kept at about Rs 600 crore, reveals Chowdhary. Half of this is to be spent through moa and half by moef. Why? Because moef believes it is central to plans: after all, 80 cent of the bamboo grows on forestland. moa knows this: it believes bamboo grown on non-private lands has amazing potential as a commodity, and only it can drive that process. Only 20 per cent of bamboo grows in homesteads, according to the pc report. nbm is meant to decrease the difference; to at least 70:30. But the actual situation is worse than the figures indicate. People in the hamlets of Manipur, Mizoram, Assam or Tripura may grow bamboo in their homesteads but they can only use it at home. If they take it on the road, move it anywhere out of their house, they have to take the permission of the forest department (fd), or else they are illegally transporting forest produce. This is how ludicrous it gets. This is the biggest challenge before nbm, yet none of the concerned agencies publicly acknowledge it. Bamboo is scientifically classified as a grass, not a tree. Yet, in Section 2(7) of the Indian Forest Act, 1927, 'tree' includes bamboo and timber includes felled or fallen tress. Further, under Section 2 [4 (a)] the term forest produce includes: "the following whether found in or bought from a forest or not, that is to say timber, charcoal, catechu etc" and "the following found in or brought from the forest, that is to say, grass, surface soil, rocks, minerals etc". The jargon implies bamboo felled or extracted from abackyard or reserved forest is 'forest produce' whose trade fd controls. But forest officers in the northeast believe it's a weed. Shantikam Hazarika, assistant conservator, forests, in Guwahati, goes a step further when he says, "It's the miracle weed of the northeast." But the stranglehold of the forest department over bamboo ensures it remains as worthless for common people. This despite a Supreme Court (sc) order dated February 18, 2004, exempting bamboo from restrictions it had earlier imposed on tree felling, on the ground that it is a grass. The forst department still keeps bamboo under the purview of Sections 41 and 42 of the Indian Forest Act, making transit passes (tp) obligatory to move it, even if harvested from a homestead. In December 2004, moef did take a positive step by issuing guidelines for felling and transit regulations for tree species grown in non-forest lands. But they omitted any mention of bamboo, leaving it to the state's discretion. Only Mizoram has used it to its advantage. 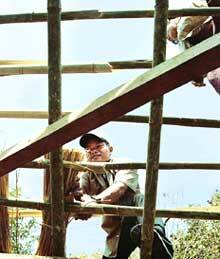 In June 2005, moef sent another letter to the states to clarify bamboo's status. It mentioned sc had banned collection of, besides other things, bamboo from protected areas by its order dated February 14, 2000. This time it forgot to mention sc had not banned collection of bamboo from non-protected areas. But state forest officers in several states stopped extraction; they ordered shut, in Arunachal Pradesh, plywood units trying to shift from timber to bamboo. "It was hilarious, they did it despite clear instructions from the High Powered Committee of the Supreme Court on Northeast to allow plywood or veneer units located inside approved industrial estates to use bamboo," says a senior bureaucrat. The industry may get its way around but not the common man. "The large traders can get tps for 3,000 bamboo and load 5,000 if you have struck a deal. But if I as a villager want to take out a few to sell from my village, I shall have to deal with the ranger I shall need a tp, this despite the fact that these are our forests. The forest department has nothing to do with them," says a member of Dimasa Student's Union in Longmaisa Dikreng in North Cachar. For state forest departments, tps are a big source of earning, officially as well as illegitimately. inbar tracked a truck from Tripura carrying bamboo to a southern state.